Days require for the trek. Food and drinks during the Everest Base camp trek. Mt. Everest base camp trek is excellent trek for first time new and old trekkers in Nepal. The trekking offers you to see natural beauty including forest, delightful mountains, rivers and so forth. Trekkers can see distinctive sorts of creatures and winged animals. Some uncommon creatures like deer, panther, and so forth. Generally during the months of March to May and Late August to September, trekking to the Everest Base Camp is considered the best. Everest base Camp trek is also not that easy as the summit soars so high that reaching to its base camp (17,590′) is an adventure in its own and that too of the highest sort. It normally takes 12 to 14 days to reach to the Base Camp of Everest that includes gruesome, tiring walking within the world’s most spectacular mountain scenery. Everest base cam trek journey is memorable from the Nepal itself where you can see the beautiful treasures of Katmandu, you can stay in the villages which are set in the backdrop of jagged pinnacles, historic evidences and their culture along with little bit of their language. While staying in Villages you will get to know the Sherpa’s; the saviors and guide in the mountains. You will be enchanted to see the remote mountain monasteries, Tibetan Buddhist prayers and mani stones. While living there you will grow a certain kind of spirituality which is required while Everest Base Camp trek. During the Everest base camp trek, you will need to be hiking 6 to 8 hours per day which is almost and all together it is around 130 K.M of entire trails. On an average through steep grades and at elevations ranging from 9,318 feet to a maximum of 18,192 feet. Some days will be rest days with optional hikes to properly acclimatize. So it will give your body some rest along with huge hard work. People from all over the world interested to know, where is Mt. Everest located? Mount Everest is located in the Mahalangur range of the Great Himalayas. It arises exactly on the border line of Nepal and Tibet in the southern part of Asia. It is also known as Sagarmatha in Nepali. Its topographical structure and geographical composition makes it one of the best destination in the world for adventure sports. The Mt. 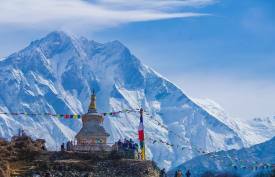 Everest region is one of the most famous and beautiful tourist destinations in Nepal, which is famous for its fantastic mountain peaks and the beauty on the hills. The Everest Base Camp Trek is starts from Kathmandu. The normal routes require for the Everest base camp trek is 12 to 14 days form Kathmandu –lukkla – Everest base camp – Lukla Kathmandu Fly in and fly out. . Everest base camp is the gateway for all the climbers that attempt to climb the highest summit of the world, the Everest base camp trek route is the most famous trekking destination that holds a long history of pride and glory too. Trekking to Mt. Everest base camp is an adventure of a lifetime and life changing for many people and Yes, It is one of the most difficult treks in Nepal. But, you can complete your trek easily if you follow our instructions. It is the dream of every adventure seeker to reach the summit of Mount Everest, the highest peak in the world. The Everest Base Camp Trek requires no technical expertise or mountaineering skills whatsoever as it is basically a long hike at altitude. Just follow our Instructions. It is strongly recommended to hire a guide for Everest base camp trek. It is so much more than just someone showing the direction and carrying your stuff. The guide is also your safety and security, all about trekking very good. Everest Base Camp trek one of the highest trek route in the world, doesn’t have to come at a high price. A Trek package to the the Everest base camp trek help interested trekkers fulfill their dream, on a limited budget. As well as help to the trekkers explore the attractions of the Khumbu region (Mountain views, Sagarmatha National Park, Sherpa Culture, important Monasteries and Sherpa settlements), all within their budget. Trek package price covers the facilities of airport transfer for Lukla flight, flight tickets to and from Lukla, an English speaking guide, porters, TIMS permit, National Park entrance fee and a shuttle service from airport to the hotel in Kathmandu (after the trek). Please read this link for cost of Everest base camp trek. When you are planning your Everest Base Camp trek it is important to know what food and drink will be available for you. No doubt there are several good options available for quality food & drinks in Lukla and Namche Bazaar as well along the entire trek route of Everest base camp trek. You will also find several coffee shops in Lukla and Namche where they serve good quality coffee drinks. You will find many bakeries in Namche and Lukla. You can eat different types of tasty dishes like: tasty snacks, pizza, momos, rolls, Noodles, soups, etc. On Everest Base Camp Trek 12 to 14 days, you will be walking with an average of 10 to 13 km a day in average, Although this does not sound very long, the terrain can often be steep, rocky, slow going and, depending on the season, icy and snowy. You can make your Everest base camp trek easier with proper training and reaching a fitness level capable of trekking with a pack on your back. This trek starts at Lukla just below 3,000 metres , the trek steadily winds its way upwards to Everest Base Camp at 5,364 metres. At 3,000 metres, Lukla is already very high and you will need to take the trek slowly if you are to reach Base Camp safely. It is very important that you seek medical advice prior to trekking at these altitudes and research altitude sickness to make yourself aware of the symptoms and treatments available. Please also note that there is no correlation between fitness, age or gender and altitude sickness – everyone is at risk. The Everest Base Camp Trek is one of the most popular treks in Nepal, and for good reason! Not only do you get to stand at the foot of the highest mountain in the world, but you also get to trek through some of the most beautiful landscapes on earth while enjoying the rich Nepali culture. This trek requires a good level of fitness, with back-to-back days hiking at high altitude. There are many opportunities to see wildlife in Sagarmatha, such as the Himalayan Tahr, Ghoral, Musk deer, Pikka (mouse hare), weasel and occasionally Jackal.